The most tragic loss a game has inflicted upon me is the loss of my time. That’s assuming that I consider playing games, even bad ones, a worthwhile use of my time, which I do. It’s also assuming that games have the ability to make my in-game time feel wasted, which they do in a particular way. Games inherently build on repetitive action, like the time-honored JRPG trope of “grinding”, where I have to play through a collection of identical mini-bouts to unlock abilities and increase my stats. However, the peculiar instance of having to restart a level, to repeat an action, having gained no buster swords, meat buns, or numbers, leaves me feeling put out. It’s a moment not unlike the “I forgot the tickets” quandary. 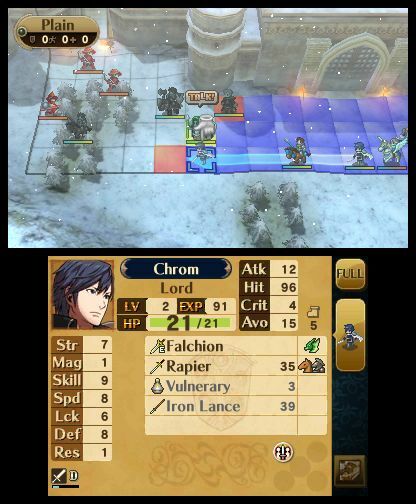 Fire Emblem: Awakening can be a library of ticketless panics. I say “can” because new games can be started under either Casual or Classic rules, the former allowing for characters to respawn after battles, the latter enforcing mechanical permadeath. Deciding between universal truths (my GOD, the power) is one of the first choices the eleventh game in the Fire Emblem series dares you to make, and it matters more than any other choice for the rest of the game. Classic, true to tradition, sucked my time into a replay vacuum like so much change in the belly of the Battletoads arcade. Casual streamlined my schedule for stats and skins. The narrative and play surrounding the death of the characters, oddly enough, remained static while I hawed about my relative anxiety and loss. With Classic, I experienced the tension of consequence and the bummer of consequence. With Casual, I had time to make jambalaya. At the start my custom-faced avatar wakes up in a field beneath a Marth-like prince and princess. Retrograde amnesia aside, it’s decided that I’m the perfect candidate to lead this kingdom’s army because I can “see the whole battlefield” and “know each move before it happens”. Sure, there’s some fourth wall vaulting going on there, but when the game insists on repeating my avatar’s name, that illusion is well-trampled already. And because my avatar Buttfart can see the whole battlefield, grid lines and all, I can shift my heavy hitters (knights, wyvern riders) closer to danger, and my healers (clerics, sages) behind them. As I learn each character’s nuances based on class, movement field, anime haircut, and weapon rank, I start mingling my invulnerable myrmidon with my great lord and protecting my fragile Pegasus riders with my high-HP dark mages. I fight off the Risen horde (see: zombie army) by playing to my weaknesses, my worst defenses and my strongest pairings, which may, if I’m Lucky +17, form one dual attacking and dual protecting unit. Point being, it sounds like a complex web of applicable statistics because it is, even though all the ideas are no newer than Final Fantasy Tactics, the tactical turn-based RPG genre’s traditional standard. There’s one thing Fire Emblem: Awakening nails that Final Fantasy Tactics doesn’t, and that’s being a lot like the old Fire Emblems. Limited-use weapons, separate attack and movement animations, isolated one-on-one combat, and a byzantine user interface makes Awakening from more like an homage than a rebirth. HD and 3D remakes have their own appeal, and new titles in a long series have another, usually more adapted and less adopted. To see Awakening stay mechanically mired in its roots is disappointing, especially when analogous reboots like Final Fantasy Tactics A2: Grimoire of the Rift made such strides in class management and cumbersome titling. Class management, or the job system, shows some age spots, particularly in “explaining-it-at-all”, where it comes up short. I eventually stumbled across a Second Seal in my playthrough, an item whose job-shifting function was only apparent after going into the Inventory menu, selecting it from a character’s item list, and trying to use it. Even then, it’s rather unclear who can become what, and why. Some characters, based only on the narrative, have to keep the same job, or are limited to one or two others. Granted, dragon fireballs are more impressive than archery, but the lack of explanation and the removal of options feels like a strong authored voice shoehorned into a player-driven genre. With a prevalent writer’s pen, though, I found myself becoming more attached to my war machines as they each told their own story, had their own accents even, and formed relationships with each other. I could marry my avatar and my cleric, and they could have a kid, and then have baby momma drama. A lovable Russian mercenary (“that sellsword dastard”) flirted with an endangered beast changeling, and then things fizzled out. A dragon-girl cleaned the barracks with a raven-cloaked enemy turncoat, and then they both died. In fact, all but five of my characters died before the credits rolled, and the show went on. Alarmingly, the show went on with them. I didn’t want to lose Maribelle, but she was weak and I got tired of restarting from my save to protect her. Then, three hours later, there she is mixing it up with the prince. The logical disconnect there was problematic enough, but even more troubling to me was Classic mode’s mistreated permadeath. 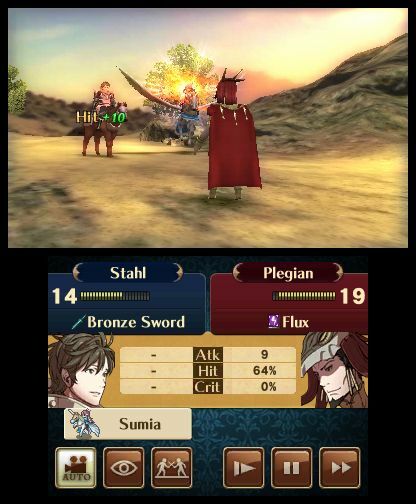 Unlike Limbo’s forgiving “trial by death” play, or Dark Souls’ unforgiving “trial by death” play, Fire Emblem: Awakening employs a kind of “death by death” play that rarely teaches and often frustrates. When a character permadied, I often found myself cursing at the game like I curse at the lottery. The vast majority of the time, I didn’t make any tactical mistakes, but the opponents Luck stat kicked in and caused a critical or double hit, or my character’s Easy Target stat flared up and drew some unexpected fire. So, in order to not lose key parts of my entourage, I’d have to quit the game, start it back up from the menu, and play the same stage again, sometimes exactly the same way. With battle-length stretching into thirty minute territory, I could chalk up a solid five out of my twenty-five hours with the game to lost progress, with nothing added. Arcades used to feed on the sheepish desire to avoid this kind of time loss tragedy—just throw in a few quarters, and make that last hour worthwhile. Grinding and DLC (unavailable at the time of review) can take the place of those quarters, as they have for years in RPGs, but when I’ve completed every side mission, had every conversation, and saved all but two party members for the duration of the game, I expect I’ve done enough grinding. Either way, more battles and experience don’t appear to be the answer to the problem of deaths of chance—only more time solves that riddle. The constant threat of unwarranted defeat did have the positive side effect of keeping me on-guard and strategic, when I didn’t do when playing on Casual. It’s a cliché, but the lower the lows, the higher the highs. Maybe removing some of the arbitrary fluctuations in-battle could resolve the issue simply. Maybe I’m just a sour grape who fell off the vine a few too many times. Permadeath aside, the one-or-two-on-one combat feels archaic and limited, given the richness of grid combat games that have ably employed the complexity of area effects. And its indifference to explaining even its class system felt like either a slight or an inside joke, landing poorly in either case. 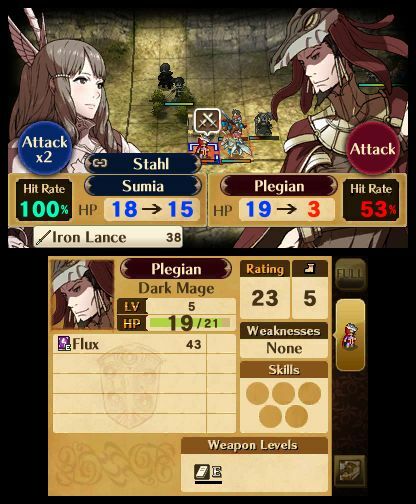 For a game that’s with committed old-school charm, no fewer than three fake-out endings, and several gorgeous 3D anime cut scenes, Fire Emblem: Awakening surprised me with its obsolete approach to UI and consequence. Dan Crabtree is an I.T. guy and freelance writer with words on Paste, Ars Technica, Kill Screen, and Gamernode. His dog is considered handsome and well-read. You can find him (the human) on Twitter.